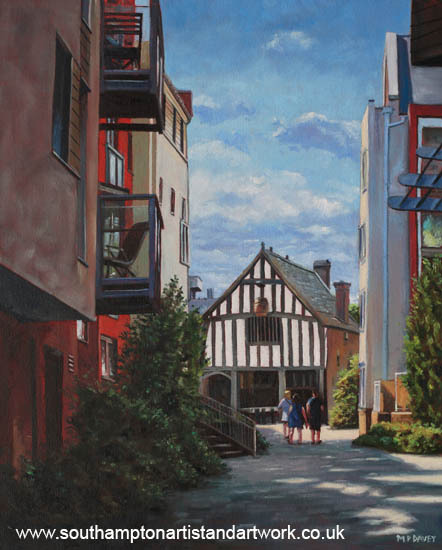 This painting illustrates the Medieval Merchant's House in the 'Old Town' area of the City of Southampton, UK, with its distinctive barrel hanging from the outside of the building. It is one of a number of treasures of old Medieval/ Tudor buildings to be found in the Southampton area. The house was build in 1290 by John Fortin, a local merchant. The house currently is in 14th century appearance. It is to be found at 58 French Street, Hampshire, SO142AT. The painting is done in oils on a red acrylic base, using a canvas board sized at 20” x 16”. It is based on a photograph taken during the summer of 2012 and painted during the summer of 2013. The house is seen through a gap in a modern development of flats, from a viewpoint standing on the main high street. I was struck by the way the modern buildings were in shadow but the merchants house was bathed in sunlight. The people were there at the time and make a good scale reference within the painting.